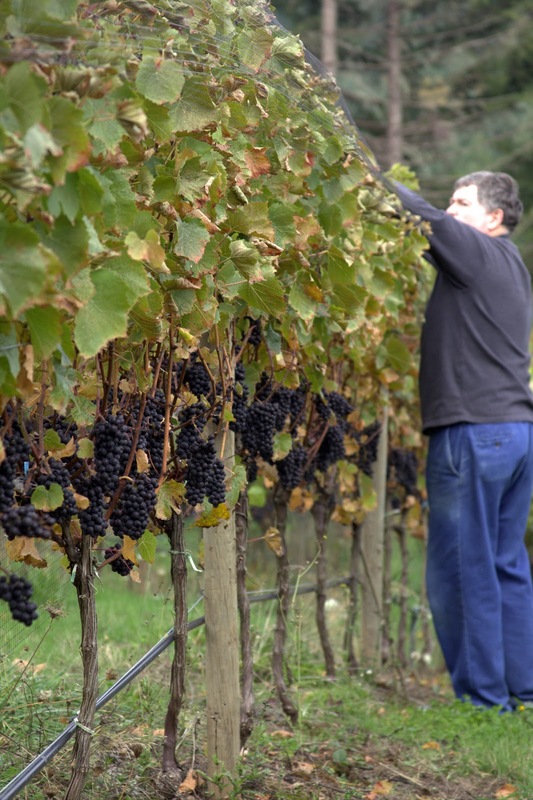 Just a few days before Halloween, Abbelone Vineyards in the South Willamette Valley harvested with scary potential. Working my way down a vineyard row, the leafy plants glowed a marbled green and gold in the late October sun. 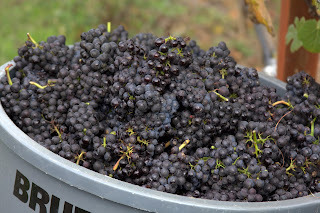 Dragging a purple, grown-up sized sandcastle like bucket through the clover and grass covered row, I helped to gather the winery’s lush, plump fruit. 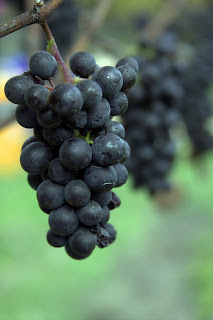 Maneuvering my hand through the twisted vines that gripped the black, beady clusters of Pinot Noir like a newborn’s little fingers, I snipped the clusters of grapes from the vines as light laughter and chatter floated above the plants. In a year that many vineyards were spooked by the late, wet spring weather, Abbelone Vineyards celebrated in style with a picking party and abundant harvest. Located in the southern shadow of Spencer’s Butte just outside of Eugene, Oregon, Abbelone is a family- run, single-vineyard winery. Producing small batch Pinot Noir, the owners Chris and Angela Ferry started the vineyard as a small farm with only 300 plants about ten years ago. Abbelone’s first vintage, a 2009 Pinot Noir, is a vibrant red wine with a distinguishingly fruiting taste that pops on the tongue. With deep cherry notes, the wine glistens with a rich, ruby red color and fragrant nose. Producing only around 350 bottles of this juicy, resonant wine, Abbelone is optimistic for another great vintage. “Your fruit tastes like your fruit” Angela described of their vineyards. And for a harvest season full of weather woes from the long, rainy spring, no worried lines crossed the Ferrys’ brow. Stopping to take a break and enjoy Angela’s specialty chili, caramel apples, and wine, the harvesters by lunch time had already filled the winery’s available bins with two tons of fruit from their small five acre hillside and more grapes still hung. With each cluster that we picked after lunch, we added to Abbelone’s total easily surpassing their 2010 harvest yield – and for a winery, who is already low on their first vintage stock, a sign of a good year to come. with yoga fluidity, holiday spirit and a passion for the wine and family they had come to love. What a great article, you made me wish I had been there. Next year I will harvest grapes! And now I have a new winery to put on my 'must visit' list.